The vision for the Georgia Farm Safety Program is to ensure the safe growing, harvesting, packing, and holding of fruits and vegetables grown for human consumption through a combined educational and regulatory inspection strategy. The mission of the Georgia Farm Safety Program is to implement, measure, and improve an integrated, risk-based, produce safety system focusing on prevention, intervention, response, and education activities of Georgia Farms that fall under the FDA Produce Safety Rule. 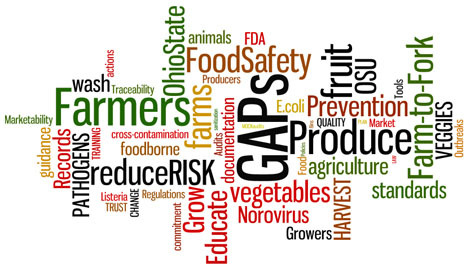 The Georgia Farm Safety Program was established in 2013 to begin developing partnerships and relationships with Georgia farmers in preparation for new regulatory requirements for produce safety under the Food Safety Modernization Act enacted by the U.S. Congress. The Produce Safety Rule establishes, for the first time, science-based minimum standards for the safe growing, harvesting, packing, and holding of fruits and vegetables grown for human consumption. It is the intent of the Georgia Department of Agriculture to work closely with the U.S. Food and Drug Administration in the implementation and enforcement of this rule. If your farm or association is interested in learning more about the Produce Safety Rule and how the Georgia Department of Agriculture may work with farmers, please contact the Georgia Farm Safety Education and Outreach Coordinator, Maggie Brown at (maggie.brown@agr.georgia.gov). The best way to protect Georgia's produce is by working together. Please assist us by identifying your farm and providing your contact information in order to receive important tips and updates regarding the implementation of the Produce Safety Rule.